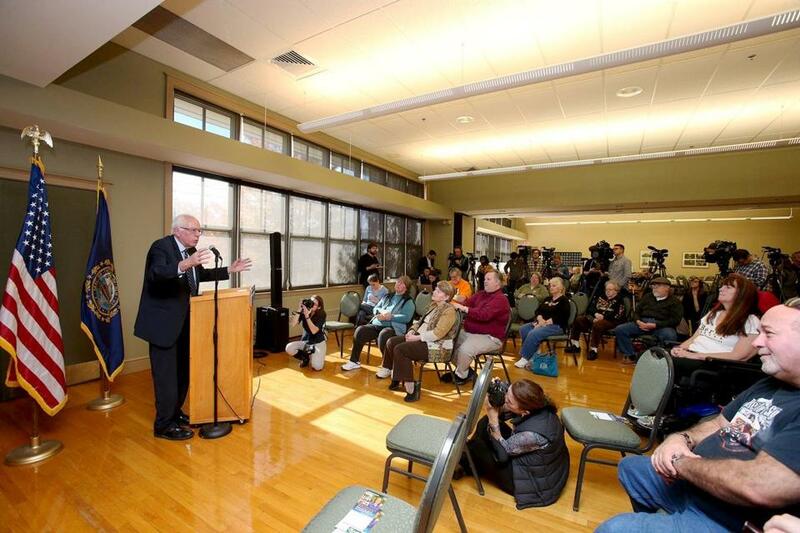 About a third of the seats were empty when Bernie Sanders gave a lunchtime talk to seniors in Manchester, N.H.
MANCHESTER, N.H. — About a third of the seats were empty when Vermont Senator Bernie Sanders stopped to give a lunchtime talk to seniors here during a swing through the state. 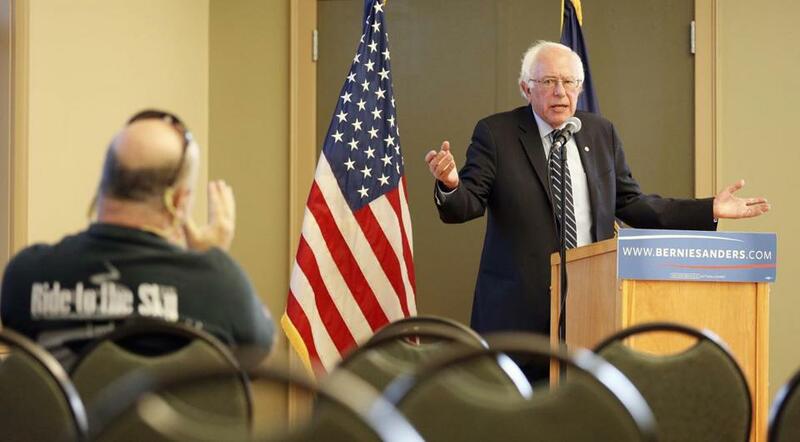 The firebrand presidential candidate didn’t even command the full attention of the room — one group remained seated at a table playing a game of cards as Sanders thundered on about saving Social Security and reducing the price of prescription drugs. Other events on a two-day swing drew greater interest, but for a campaign known to attract thousands, the crowd Friday was one of his smallest and was perhaps a metaphor for the next act of Sanders’ campaign. It’s shaping up to be more combative and negative, with direct barbs pointing at front-runner Hillary Clinton. It will be more targeted, with messages tailored specifically to key voting groups still inclined to be skeptical of Sanders’ message. As the Democratic contest has become essentially a two-way race heading into the final three months before voting begins, Sanders is trying to move beyond his core audience while also keeping his base revved up. Though national polls show the odds are against him, and his senior staff acknowledges that Clinton is finding her footing, the Sanders campaign is readying for combat. They’ve pledged to double down in Iowa and New Hampshire, where Sanders held three town hall meetings and planned to go trick-or-treating with his three grandchildren who live in the state on Saturday evening. Soon, perhaps as early as next week, pro-Sanders TV commercials will begin. Despite the candidate’s philosophical aversion to poll-tested messages, these spots were guided by polling data that his campaign has only recently started collecting and analyzing. The Sanders commercials weren’t finalized by last week — but outlines hit on Sanders biography and seemed tailored to address a weakness: That Sanders’ iconoclastic outsider message doesn’t convey to some that he has the skills and temperament to govern. Bernie Sanders is trying to move beyond his core audience while also keeping his base revved up. Pictured: Sanders in Manchester, N.H. The ads allow Sanders to deploy another weapon: the $25 million pile of cash sitting in his campaign bank account. That funding could allow Sanders to match Clinton’s campaign spending on television, which began in early August. Expanding his reach beyond the Sanders faithful can be humbling — as evidenced on Friday at the William B. Cashin Senior Activity Center in Manchester. Recent public polls show Sanders ahead in New Hampshire, but among seniors, Clinton holds a commanding lead. A Sanders campaign aide explained that the event was organized by the senior center, and the campaign didn’t advertise it. Sanders adjusted to the size of the crowd — asking audience members questions to engage them in more of a conversation as he gave his speech. “You’ll ask me questions, I’ll ask you questions,” Sanders said at the top. He did get an actual response: An audience member suggested food banks and charity. As he was ushered out, Sanders also made an effort to engage the card players — stopping by for a quick hello before rushing out of the center. In Virginia on Wednesday, he catered to a different audience: youth. He used what he called a “national town hall” with students at George Mason University (and more than 250 other colleges listening on line) to talk about legalizing marijuana, which Sanders supports. In New Hampshire amid brilliant fall foliage Friday, Sanders referenced Clinton by name repeatedly while talking to seniors and again during a visit to his Nashua campaign office. Several of those who attended said they don’t want personal attacks. “I appreciate the way he is campaigning so far,” said Kathy Thomson, 62, who attended the meeting. However, the brewing showdown was also evident in a round of televised interviews and speeches last week, in which Sanders drew sharper contrasts between his views and Clinton’s — particularly on the subject of regulating Wall Street. Sanders also became mired in the sort of daily back-and-forth with the Clinton camp that he has said he seeks to avoid. The tiff started after Clinton, who for months hardly ever acknowledged Sanders, seized on a comment he made during the Democratic debate last month that there’s too much “shouting” about changing gun laws. During an event in Virginia shortly after the Democratic debate, Clinton said: “When a woman speaks out, some people think it’s shouting.” She repeated the refrain at several other events. Clinton declined to answer questions at a campaign stop in New Hampshire on Thursday about whether she considers his words “sexist.” But her campaign has kept up the sexism drumbeat, via surrogates. On Saturday, Sanders acknowledged at a press conference that the campaign has become more personal. “I think that is unfortunate,” he said.